The Northern Ireland Cancer Trials Network (NICTN) presented at an Open Day on 17 February 2018 hosted by the Centre for Cancer Research and Cell Biology (CCRCB) in Belfast, Northern Ireland, UK. As part of the NI Science Festival, the public was welcomed to the CCRCB Open Day on Saturday, 17 February 2018. 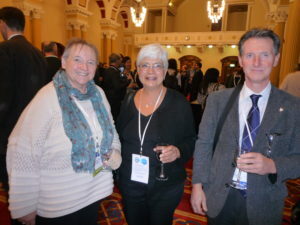 The event ‘Celebrating a decade of advances in cancer research in Belfast’, invited the public to drop in to hear about clinical trials, the NI Biobank and population-based cancer research, and to meet staff from the NICTN and members of the NI Cancer Research Consumer Forum (NICRCF). The NICRCF utilise public opportunities to raise awareness about the availability of clinical trials including MErCuRIC. There were lab tours and interactive activities for the whole family. Talks were facilitated by leading researchers who are translating science into clinical practice. See the full programme here. The Open Day was attended by over 300 people from the Belfast area. 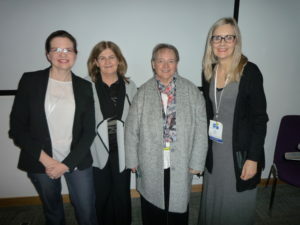 Pictured below left to right at EAPM Congress 2017: (left photo) Margaret Grayson with Barbara Moss of EuropaColon and Mark Moss, a Patient Ambassador, and (right photo) Lydia Makaroff ECPC Director, with Majella Woods, Margaret Grayson and Ruth Boyd of the NICRC Forum. 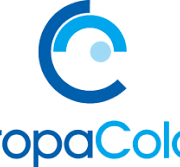 Bowel cancer/CRC patients: Please contribute to an important survey that will help EuropaColon understand how patients cope with a diagnosis of metastatic colorectal cancer. 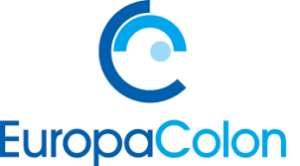 EuropaColon aims to unite patients, caregivers, healthcare professionals, politicians, the media and the public in the fight against digestive cancers. The Organisation works with 43 groups in 32 European countries and has been recognised as the voice of colorectal cancer patients in Europe. Healthcare in Europe is different in every country. You might live in a country where a healthcare team supports you from diagnosis onward, and you might have access to the latest treatments and medicines for cancer as well as support from the different services. Even so, your experience is important to us because regretfully in some countries patients are not so fortunate. This is the first time a survey like this has been commissioned in Europe for colorectal cancer. In order to make this information valuable, EurpoaColon needs to recruit 1000 patients across Europe and aims to get responses from100 patients per country. Please share this information widely! The survey is available in 14 European languages. Find it here. 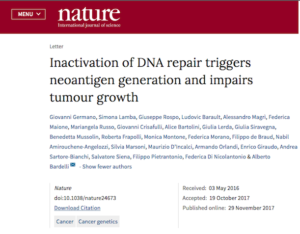 ‘Inactivation of DNA repair triggers neoantigen generation and impairs tumour growth’ by authors Giovanni Germano, Simona Lamba, Giuseppe Rospo, Ludovic Barault, Alessandro Magrì, Federica Maione, Mariangela Russo, Giovanni Crisafulli, Alice Bartolini, Giulia Lerda, Giulia Siravegna, Benedetta Mussolin, Roberta Frapolli, Monica Montone, Federica Morano, Filippo de Braud, Nabil Amirouchene-Angelozzi, Silvia Marsoni, Maurizio D’Incalci, Armando Orlandi, Enrico Giraudo, Andrea Sartore-Bianchi, Salvatore Siena, Filippo Pietrantonio, Federica Di Nicolantonio & Alberto Bardelli was published in Nature and online 29 November 2017. Abstract: Molecular alterations in genes involved in DNA mismatch repair (MMR) promote cancer initiation and foster tumour progression1. Cancers deficient in MMR frequently show favourable prognosis and indolent progression2. The functional basis of the clinical outcome of patients with tumours that are deficient in MMR is not clear. Here we genetically inactivate MutL homologue 1 (MLH1) in colorectal, breast and pancreatic mouse cancer cells. The growth of MMR-deficient cells was comparable to their proficient counterparts in vitro and on transplantation in immunocompromised mice. By contrast, MMR-deficient cancer cells grew poorly when transplanted in syngeneic mice. The inactivation of MMR increased the mutational burden and led to dynamic mutational profiles, which resulted in the persistent renewal of neoantigens in vitro and in vivo, whereas MMR-proficient cells exhibited stable mutational load and neoantigen profiles over time. Immune surveillance improved when cancer cells, in which MLH1 had been inactivated, accumulated neoantigens for several generations. When restricted to a clonal population, the dynamic generation of neoantigens driven by MMR further increased immune surveillance. 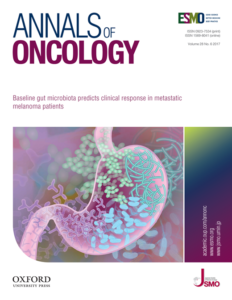 Inactivation of MMR, driven by acquired resistance to the clinical agent temozolomide, increased mutational load, promoted continuous renewal of neoantigens in human colorectal cancers and triggered immune surveillance in mouse models. These results suggest that targeting DNA repair processes can increase the burden of neoantigens in tumour cells; this has the potential to be exploited in therapeutic approaches. 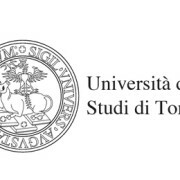 Read about the role of the Universita degli Studi di Tornino in MErCuRIC here. 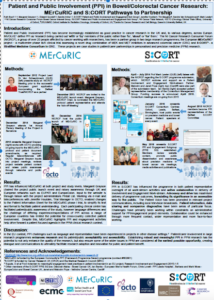 Ruth Boyd and Margaret Grayson will present MErCuRIC as a case study in Patient and Public Involvement (PPI) in research at the European Alliance for Personalised Medicine Conference which is being held this week in Belfast, UK. The conference theme is ‘Personalising Your Health: A Global Imperative!’ and runs from 27- 30 November 2017. For more information for patients interested in MErCuRIC, please click here. Download the poster here EAPM Final Poster. Our MErCuRIC partners at the University of Torino (UNITO) have recently published two important papers. 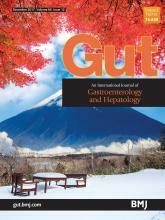 One appears in the October 5, 2017, edition of Gut, “Discovery of methylated circulating DNA biomarkers for comprehensive non-invasive monitoring of treatment response in metastatic colorectal cancer.” The second paper titled, “Tracking a CAD-ALK gene rearrangement in urine and blood of a colorectal cancer patient treated with an ALK inhibitor” was published in the October 2017 edition of Annals of Oncology. For additional information on these and other MErCuRIC publications, click here. The team of Prof. Alberto Bardelli in the Department of Oncology at UNITO are pioneers in the tailoring of drug combinations to overcome resistance. During MErCuRIC, the group contribute to translational research aspects of the project and provide expertise in identifying resistance biomarkers, ctDNA based biopsies and xenopatient-based drug testing. The 1st European Alliance for Personalised Medicine Congress – ‘Forward As One: Making personalised medicine a reality at national level’ is being held 27 – 30 Nov 2017 in Belfast, Northern Ireland. The congress will be interactive, focusing on diseases, general science issues (Big Data, genomics, clinical trials, etc.) and the views, progress and health landscapes across Europe. With involvement from policymakers/regulators, MEPs, national healthcare officials, patient groups, HTA bodies, academics, researchers, healthcare professionals, industry representatives, journalists and more, the aim is to shape the EU health landscape now and into the future. Registration is open and a preliminary agenda is now available. Click here to apply and for further details. Travel grants available in limited number. ‘Science for advocates’ will be a 2-day interactive workshop (Friday afternoon till Sunday lunch-time) with a combination of lectures, independent and group work. To ensure effective communication, the workshop size will be limited to 35-40 European Cancer patient advocates. Participation is upon application only. Advocates will have the opportunity to suggest a relevant scientific study of their interest as a test case for the workshop. Otherwise, ESMO faculty will be asked to name one recent relevant study per cancer field. During the weekend, participants will have the opportunity to directly apply learned content to their study of interest, including the statistical background and the calculation of the ESMO MCBS for that therapy, and generate an infographic representation of the content. Click here to apply and for more details. EUPATI as an EPF programme is approaching the end of its first year, and EPF President Marco Greco evaluates the achievements – and challenges – of this new environment and shares his perspectives here. 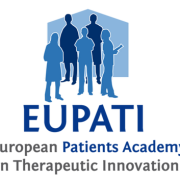 The EUPATI Training Course Patient Experts in Medicines Research & Development has 57 new participants in cohort three. This exciting and unique opportunity offers patient advocates expert-level training in medicines research and development, specifically tailored for them. Read additional EUPATI news from Germany and Switzerland here.